Happy Monday! Welcome to the start of a fresh new week! When a new year begins, weeks stand tall and straight like dominoes and then they immediately start to fall, one by one, inexorably, involuntarily. They fall face down to cushion the fall of the next week, poised and ready in line, until all 52 of them are in a heap at your feet. Hammy wrote that. I found it stuck under one corner of his cage yesterday when I was cleaning. He is quite the dramaticist, isn't he?! But he's right you know, so grab this week, look it straight in the eye, and make the most of it before it falls! The embossed background panel is from a Michael's Recollections pad called, "Embossed Neutrals." The corrugated cardboard paper was die cut from a NBUS MFT Die-namics die called, "3 x 4 Notepad." I then used a NBUS PTI "Bold and Beautiful" die and stamp for the inlaid sediment. The heavily winked pencil is from GKW. I have had it in my stash forever. I suspect I cut it out of a magazine and it's fun to finally use it on a card. CAS Mix-Up Card Challenge: Corrugated cardboard, stamping, and die-cutting. Pixie's Snippets Playground: Use snippets. 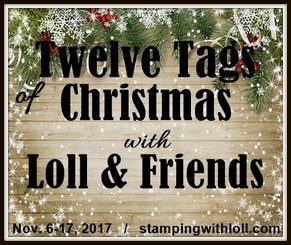 Sweet Stampers Challenge: Use a sentiment. "I probably would have die cut in black cs rather than attempting to stamp ... ."
Well, slap my forehead and call me a biscuit, why didn't I think of that?! This community is the BEST! I hadn't yet sent my goofy little hidden-word card off to anyone, so I did as Vicki suggested and just look at how glorious her idea turned out! Love your note card to Hammy - he is quite the most eloquent of Hamsters!! Well done Hammy! The 'save' on the second card is quite dramatic - love the new and improved version! A great card for Hammy and Vicki's suggestion for your second card is perfect! I love that notebook card - how do you die cut the corrugated card without all the ridgey bits getting squished? I'm seeing quite a lot of die cut corrugated card around yet I know if I tried it would end up a flattened mess. Brilliant rescue job on the second card, although I know quite a few people who deserve a "Sending Thugs" card. Hi Darnell, Love the thank you card. Your other card with the change is fab. A great save. Two great cards Darnell! Your little Hammy is quite the deep thinker. He deserves such a beautiful thank you card. Your coloring is beautiful on the other card and yes, the sentiment is so much easier to see being die cut like that. Great save! 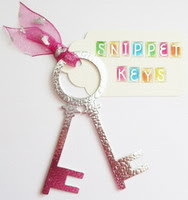 Terrific snippets card and I love your amended version of the floral hidden message card. Vicki's suggestion certainly made the sentiment pop into making it eye opening and really pretty. Great thank you card Darnell, great for a guy and I love the corrugated paper. Your "sending thugs" had me cracking up, and your re-do (and original) are gorgeous! Love the bright happy colors! Hammy's very smart! I wish I had half of that :) Beautiful card! I like how you've used Vicki's idea! So much more beautiful now! So perfectly put, Hammy. Love the thank you card with all the textures. And what a great save for the hugs card, turned out great after all. Love the small cardboard on your first card! It is such a great card and can be sent to both woman or man wich is always a bonus! 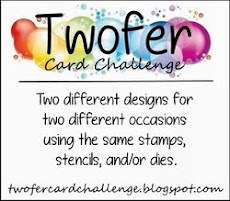 Wonderful snippets card my friend! I bet Hammy will be pickled tink! And the save of your other card is just fabulous! Fab thank you card Darnell, love the pencil. Hammy definitely deserves a card for his words of wisdom! Great save on your floral card which is now fabulous! Hammy is going to love his card just like we do! Love the card with the die cut on it too. Makes a world of difference. Oh wow--your re-do is fabulous--the perfect fix! Love the embossed paper for the first card & fun sparkly pencil! Hope the next storms don't hurt you guys! This is such a wonderful card. Thank you for joining us at the Sweet Stamoers Challenge and i hope to see you again. Hi Darnell, WOW clever Hammy, we must grab that week!!! 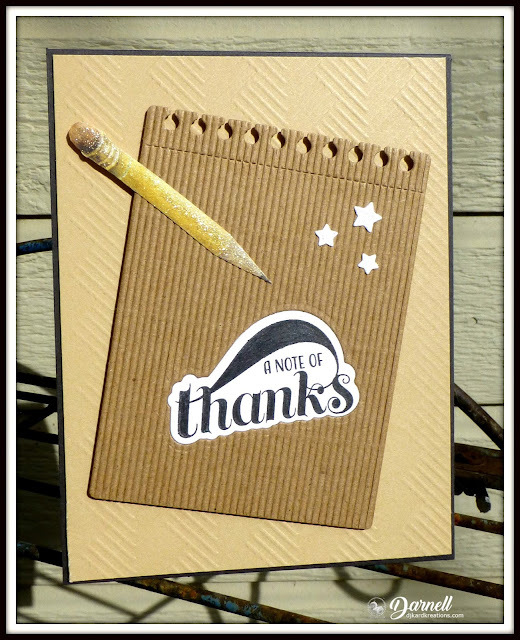 LOL I am loving your note of thanks card, super ribbed kraft, it all sits so well together :) Viki's suggestion worked wonders, YAY!! Clever Vicky, turned a great card into a stunner! Wow! Hammy is just a genius... :D The image of weeks put straight as tassels of domino, and their falling, is really a great vision! He surely well deserves your beautiful card and that pencil is just stunning! Who knew that Hammy was such a deep thinker??!! :) So true ... enjoy the moment! What a fun card you made him for all his words of wisdom. The corrugated note pad is so creative and fun. Thanks for sharing with us at CAS Mix Up! Beautiful note card Darnell..and really Vicky's idea made the card stand out..love it. Well said, Hammy! My dominoes are falling more quickly all the time. Now, about that note card... You've got my thinking cap on in regard to die cutting corrugated card stock. I have some that's almost too bulky for a card and maybe I could squish it down a little bit by die cutting. I love how it looks on your card. Clever, too, to see the value in the "found" pencil. It worked out great! 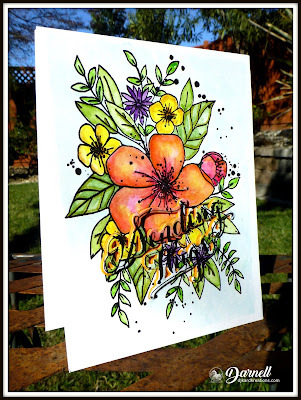 Fabulous do over on your gorgeous flower card! Wow! The sentiment really stands out now and looks amazing! Well, isn't little Hammy wise? My resolution is 'Don't waste time' and it's going pretty well so far. (Apart from all the time on other peoples blogs). Love your textured card and the blooms are brilliantly saved! Love both of your cards. The die cutting save on the second card makes all the difference. Love it. Glad you were able to change it. Really like both cards. but the pencil and note pad are just my style. love the simplicity and clean lines. I love Kraft and corrugated card so your gorgeous CAS design has ticked all the boxes for me! I would have tried to stamp the sentiment too - so we are both biscuits! Hiya Darnell, A really clever card, perfectly presented, love the pencil and corrugated page. A fabulous alteration to your second card, totally stunning. Beautiful thank you card you created. And, I love the remake of the inset sentiment too. I redid mine several weeks ago as well. That pencil and note note card is so fabulous Darnell, I love all the different textures. Your reworked sentiment is fantastic stamped in white on black...heat embossed too? What a wonderful rework, nice to have suggestions from bloggy friends n'est pas? Loving that notepad and pencil, but the "sending thugs" card just cracked me up! lol Vicki did have a great fix for it however - I learn SO much whenever I come here! Thanks!! Beautiful cards, Darnell. And what a fantastic fix/save to a beautifully coloured card. 💕 Great job! That pencil is so realistic looking! And that Hammy is a wise one ;) Vicki's idea was brilliant, love the way your re-do looks!! Oh how FUN that pencil card is. The sparkle on it looks so cool!! Your fix for your second card is what amazes me though. LOVE the re-do!! Love, love, love the thank you card and what a brilliant fix for the floral. Genius! Love your thank you note- that background is so striking. I hope you are stringing all of Hammy's pearls in to a lovely necklace. Beautiful rescue of the floral card. What a talent Hammy has!! I love that bit of sage advice! Your thank you card to him is very cute! It is so much fun to finally use something we have had around for a long time. The floral card is awesome. 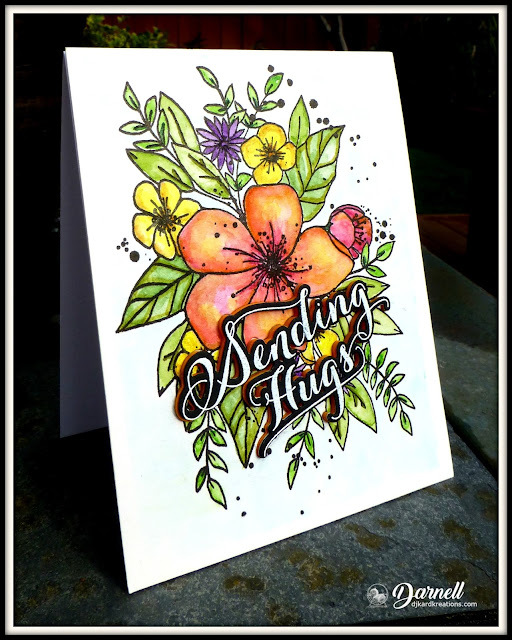 I got a chuckle because I had missed its first outing as "Sending Thugs", but with that small change, it is a wonderful card for sending hugs! You're right, this community is awesome. Have a great week. This one will fall sooner than we think. Great card for your in-home bard. Hope Hammy keeps on writing...and you keep on sharing his words of wisdom. Your save on the second card was perfect. It's very easy to read now. Wish I could have that kind of input on every card I make. Then maybe there wouldn't be so many that get taken apart and reassembled - hopefully for the better. oh I love this wonderful card and that pencil is super. What a very fab idea for you lovely design. I bet Hammy was pleased with it. Yes Vicki was right about the greeting on your other card as it really looks very stands out moe now. I LIKE the idea of sending thugs somewhere by post ... perhaps a previously uninhabited island! No, seriously, your first card looked good but I have to agree that the second looks special with the die cut. All Hail to Hammy the wordsmith too! You really make me chuckle when I read your posts ... Thank you for that! I'm sure Hammy will love your beautiful Thank you card... And my .... Your rescued card is absolutely stunning!!! Have a lovely week! Darnell, you are always a tonic. I love to read your posts and as usual I had a good old chuckle at this - that Hammy really is a clever little thing and I am so glad you made a card to honour him, he deserves it! I love how you put a card together, you always manage to get all elements just right - that's not easy. And I really like the use of natural cardstock on this (plus that notepad die surely has to be a staple die that I need to invest in?). Also loved the "Sending Thugs" card surgery - it did indeed look fabulous with the black die cut. I do this sometimes with mine, particularly when the background is busy, but of course didn't think to let you know this. It looks wonderful and we can always rely on our blogging buddies to help us along the way - that's why I love this community. Both great cards, Darnell. Love the reworked sentiment. You are so right about the weeks falling at our feet! They go by so fast these days, that I'm into next week before I've even focused on today! Does that make sense? Anyway, I love your not of thanks with the corrugated note paper! The pencil is amazing and a perfect fit! Although I loved the idea of a pretty card to send thugs with, the white does work great! It's absolutely clear that you are sending hugs! :>) Thanks so much for sharing with us at CAS Mix Up! Such wisdom from one so wee. Your card to Hammy is wonderful! That pencil is so realistic, I hope he doesn't get disappointed when he tries to pick it up! Your fix on the "Thugs" card made all the difference - so beautiful! Hammy is a perfect example of "thinking outside the cage". He has come up with some wonderful ideas for you and you're lucky to have him as a helper. I know he will love this clever thank you card you made for him. Vicki's tip sure made your sentiment stand out. That's what I love about blogging - we learn so much from one another. Stay dry. How thoughtful you are to create such a fabulous card for Hammy! I hope he appreciates all the work you put into it, especially how you added the inlaid die cut and that awesome pencil! It seems like Vicki was spot on with her advice...your card was so beautiful, and now it's STUNNING, Darnell! And, you're right...this is such a wonderful community :) Hugs to you! You crack me up, Darnell, or Hammie does, haha! Your note of thanks card is so cool - I'm glad you used that adorable pencil - it's perfect here! I also love how you fixed your hidden sentiment card - what a difference! 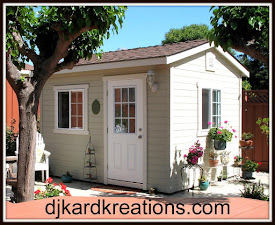 Great idea by Vicki! Hammie sounds like the rodent version of Robert Frost...he's definitely taking the road less traveled...stretching his creativity to the max. He'd have to appreciate all that texture on his thank you card...I know I do. I think Vicki should critique all our cards because that addition you made to this floral turned it from lovely to magnificent. Such a great mind should share her knowledge with everyone...don't you think? It could be a new career for her. Hope the recent winds didn't cause any damage in your neck of the woods. They were certainly wicked here. Who wouldn't like to write a note with a glamorous pencil like that. It's so sweet of you to make a special thank you card for Hammy, Darnell. Great fix for the sentiment of your lovely flower card! And a perfect thank you note for Hammy and his words of wisdom. I wish my childhood hamsters had been as wise as he is! Love the use of the corrugated cardboard for the torn-off note page! And the pencil and stars are perfect finishing touches. Thanks for joining us at CAS Mix Up. So pleased Darnell you were able to play in our CAS Mix Up Corrugated challenge. Love your fun textured card. TFS Hugs..
From fab to fabulous just like that! Beautiful! Oh, that Hammy is just the cleverest little rodent around to come up with such words of wisdom, Darnell!!!!! And you have made him a wonderful thank you card with a lovely glittery pencil and some lovely texture and sweet little stars and a great sentiment stamp!!!! Great CAS feel to your card, my friend!!!! And how great does that thugs card look now!!!!! Simply beautiful - clever Vicki!!!!! Oh Darnell. The cards look fabulous. So glad the idea worked out. Thanks for the shout out and humble you liked my idea. Sorry I missed this - hubby's away this week so I am a little behind with my online friends. So in other words.... beware of falling weeks least you get buried beneath them. Good save (and kudos to Vicki) for the Sending Thugs card. Although, truly some weeks I could use some thugs more than hugs. So Hammy is also quite the poet! I really like what he wrote and it's true! He was probably proud that you made him this awesome card! Love the new sentiment on your flower card! So much easier to read! Isn't it wonderful how we all learn from each other? Your card was already beautiful... now it's gorgeous! The die cut sentiment really made a difference, love how it turned out! Hope you are now fully recovered and in good shape :)! Hello Biscuit! (Well, you did say)!!! My, I have got behind haven't I? A fantabulous card as always. You could make me like Kraft card lol! Love how you have re-styled your hidden sentiment card. Looks amazing.